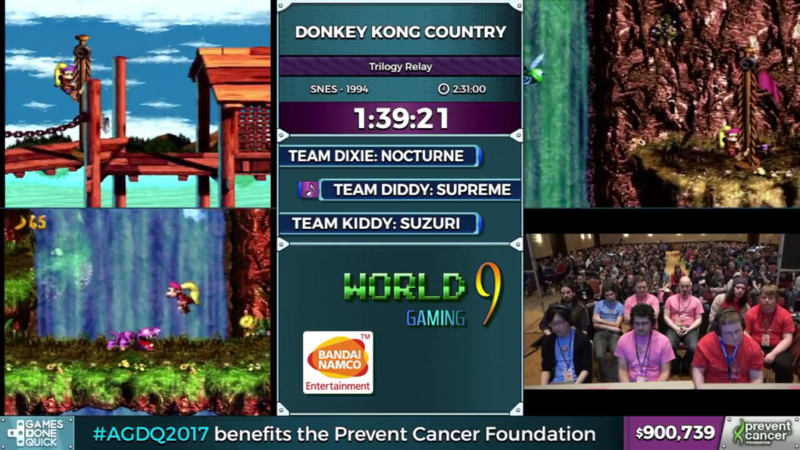 AGDQ ’17: Donkey Kong Country Trilogy (SNES) Relay Race! 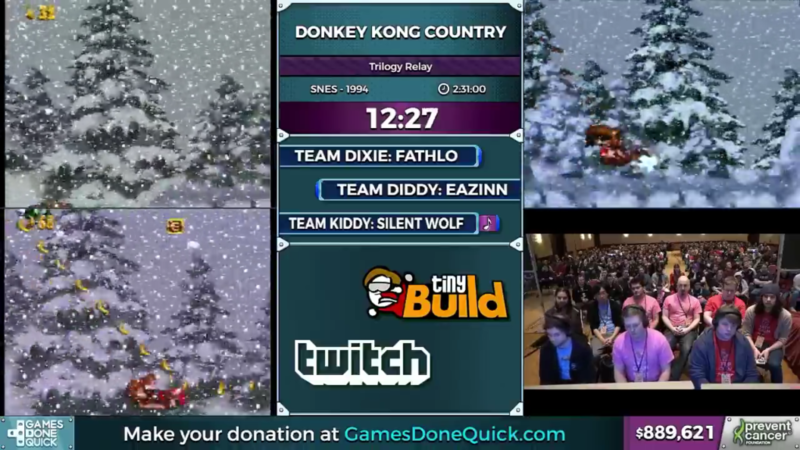 Every now and again, AGDQ puts on relay races. These runs highlight multiple games (usually belonging to the same franchise) beaten back to back. Relay races are some of my favorites, especially for games that I haven’t played a ton of. Donkey Kong Country actually falls into that category, as I never spent much time with the second and third games in the series. 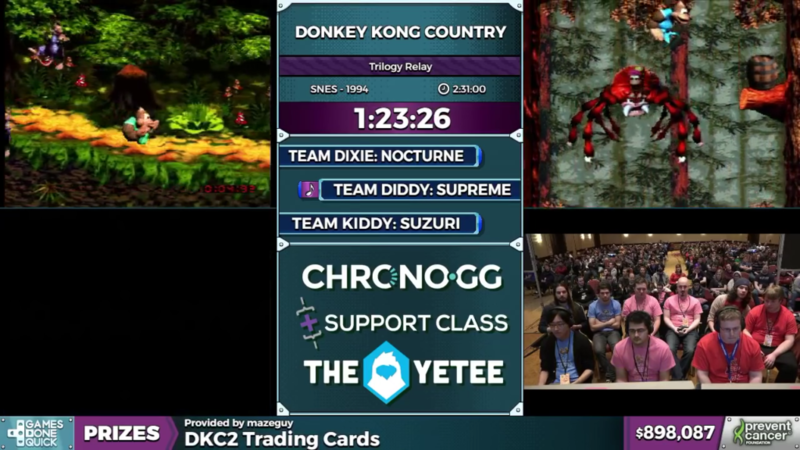 As we close up our AGDQ 2017 coverage, the Nintendo ape had to make an appearance at some point, so what better way than a full display of his SNES glory? Since there’s three individual games, we have teams of runners competing against each other. So things don’t get confusing, I’ll identify them by color. 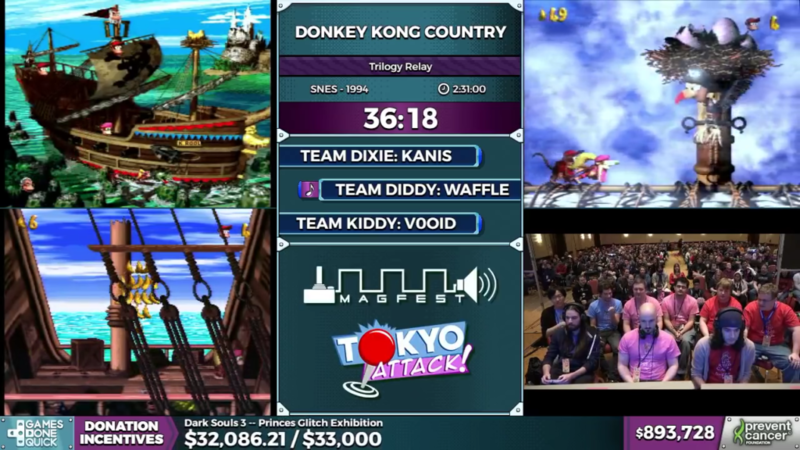 Team Diddy consists of Eazinn (DKC), waffle42 (DKC2), and Supreme (DKC3). 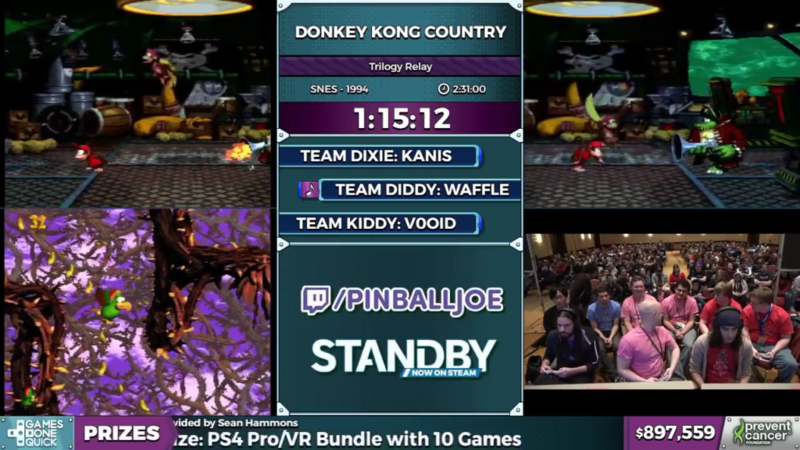 Team Dixie is made up of Fathlo23 (DKC), Kanis999 (DKC2), and Nocture_ (DKC3). 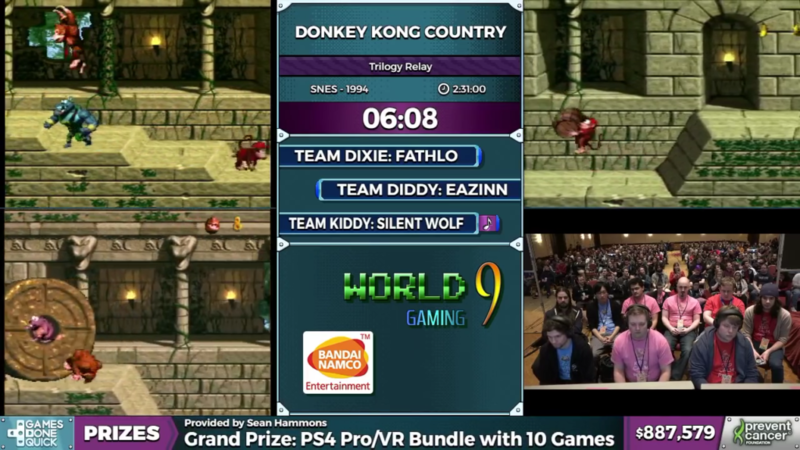 Finally, Team Kiddy is made up of Silent Wolf (DKC), V0oid (DKC2), and suzuribaco (DKC3). With that out of the way, let’s get into the festivities! The original Donkey Kong Country is the most technical of all three games, featuring many frame perfect tricks and platforming difficulty. The relay race is being played under the “All Stages” category. Technically, Donkey Kong Country can be finished in around 8 minutes using huge glitches. Diddy Kong is actually a faster character, so the runners will ironically be using Diddy Kong as much as possible. Looks like Donkey Kong will take a back seat! One of the early tricks shown off is the “extended roll”. This is done by releasing the Y button as you hit an enemy, and then re-press Y quickly thereafter. It’s a highly technical movement mechanic, and shows off the base requirement for moving quickly. This is a constant mechanic being used, and is present throughout the entire run. Throughout the game, the runners take advantage of warp barrels. These are intended to be used by the developer, and skip you ahead in the world. They access some of these earlier using another glitch called “super jump”. This is done by taking intentional damage and launching off an enemy. This glitch allows them to skip entire sections (remember the wasps?) with ease. The most impressive glitch is the jump roll, which a frame perfect trick. By killing and enemy and executing a roll on the same frame, Diddy Kong gets launched horizontally in a never ending roll animation. These jump rolls can save anywhere from 4 seconds to 46 seconds. Donkey Kong Country is very impressive to see, mainly because the tricks start stacking upon each other. By the ice-themed World 4, extended rolls are common place, and super jumps get tied into other tricks such as barrel boost. It sounds like what it looks like; using a barrel to boost yourself further. These tricks are all timed with incredible accuracy, and often within a one frame window. Things get especially crazy when super jumps get combined with jump rolls. The amount of movement technique combined with frame perfect tricks truly show off just how technical the original Donkey Kong Country is. As far as our teams go, Team Kiddy holds the lead for most of the game. However, due to a few missed jump rolls and a late-game death, Team Kiddy loses the lead to Team Diddy. 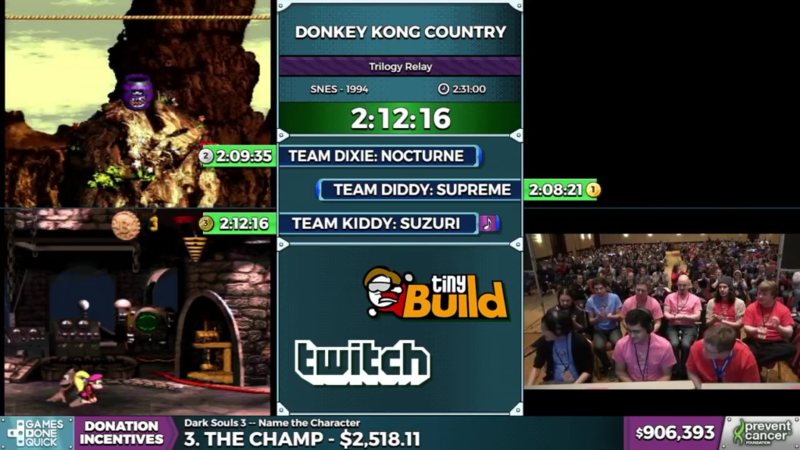 Team Diddy finishes up in 33 minutes and 37 seconds. Donkey Kong Country 2: Diddy Kong’s Quest is much like the original, but with some key differences. One of the early differences is wrong warps, which access warp barrels in an unintended way. It’s a difficult glitch to explain, but is done by manipulating throwable items to produce an “invisible barrel”, which is then thrown at a specific time and place. This saves a small amount of time in the beginning, but is utilized to great effect in later worlds. Some movement technique from Donkey Kong Country 1 returns, namely the super jump. While not as impressive as the jumps seen in the original, these are still utilized to great effect. Most of the speed run is a display of platforming skill. Rolls are a bit crazier and stressful. Several swamp levels have constant extended rolls and jumps. All of these actions can result in death, and this is where we can see our runners getting into a distinct rhythm. Donkey Kong Country 2 also introduces us to Dixie Kong. Much like Donkey Kong before her, Dixie takes a back seat to most of the run. However, she gets some love throughout the game. Additionally, the game introduces animal sections, playing as the snake, parrot, rhino, and more. I can only imagine that this adds quite a bit of complexity, as each new animal controls differently. Most of the mine cart levels are shortened by precise jumps that save fractions of seconds. Consistent skill and timing leads to larger time saves. This is best seen in levels like Parachute Panic, where Dixie Kong free falls through a bee infested area. Team Diddy pulls this off perfectly, and although it’s not the hardest level to learn, it’s one of the coolest looking ones. Through DKC 2, the team standings don’t change much. Team Kiddy suffers further setbacks after V0oid fails a few key skips. Team Dixie fairs well after a solid run from Kanis. Team Diddy further their lead even more, as waffle has a fantastic run, finishing in 41 minutes and 8 seconds (a marathon record!). Donkey Kong Country 3 is similar to DKC 2, at least in regards to early wrong warps. It’s another technical game, but doesn’t feature some tricks like wrong warps. In the speed run community, DKC 3 is arguably the “freshest” of the three Donkey Kong Country games. A lot of research and strategy development has gone into DKC 3 lately, and our runners are looking to execute on these new techniques flawlessly. Much of early DKC 3 is Donkey Kong at its purest. There’s some light time saving, but a lot of the speed comes down to platforming skill. Although I’ve said that before, DKC 3 resembles a more intended kind of platforming. Rather than a bunch of extended rolls and super jumps, a lot of the skill involves playing “within the lines” so to speak. The biggest difference between DKC 3 and the rest of the series comes with the boss fights. Unlike the previous games, boss fights have large time saving strategies. Bosses in the previous games were considered down time; a relaxing boss fight is actually quite common. DKC 3 pumps that up, as boss fights become key shifting points where runners can lose serious time or gain serious ground. There’s also a hefty amount of planning that goes into how each level is played. Certain enemies are avoided specifically to avoid screen lag. What is considered a minor annoyance to casual players becomes precious time saving opportunities. Additionally, health management plays a large factor in quick play. DKC 3 features different abilities across the different characters, so having the correct Kong alive is crucial. This is referred to as “Kong order”. Certain sections are also quicker when you only use one Kong, which means you have little room for error before a death. This makes risky strategies even more stressful, and adds tension to every second. This makes it much more impressive when things go awry and the runners are able to recover relatively quickly. Speaking of the importance of Kong order, the runners actually do World 3 and 4 out of order. This is purely due to the time that having the correct Kong order saves. World 3 also shows off some damage boosts in the first waterfall level. This is a common speed run tactic, and uses the knock back that accompanies taking damage. This allows the runners to access areas quicker or skip obstacles. Everything post-World 5 is specifically impressive for those who have played DKC 3 before. This is where the game truly gets challenging. The latter half of the run also holds one of the biggest skips of the game, which entirely skips the end of world boss. This is done by dying at a specific moment and pressing the “Start” button on a specific frame, which causes the skip. Team Diddy and Team Kiddy manage to get it on their second try, with Team Dixie taking a handful more. 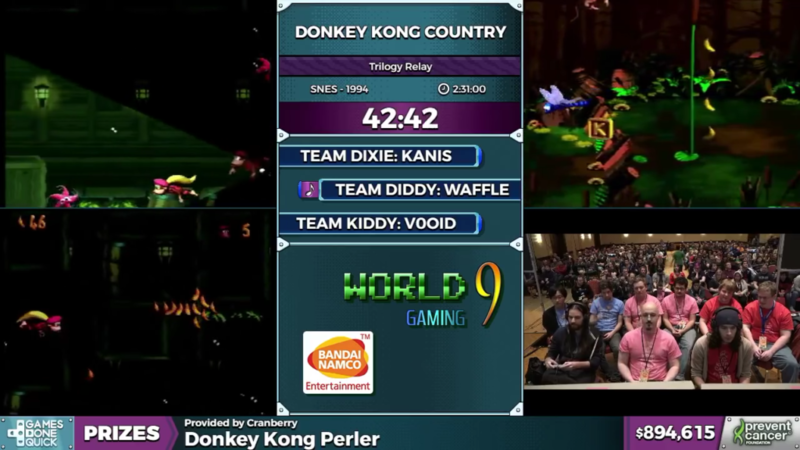 The rest of the run remains tense, as World 7 ramps up the difficulty even more. As our teams roll into the final boss, Team Diddy keep their commanding lead. Team Dixie follows up in second place, with Team Kiddy closing out the race. What a race it was, too! 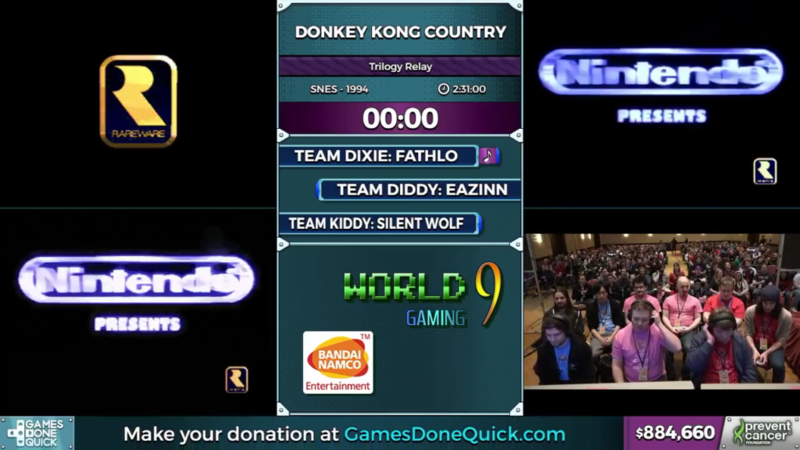 In just over 2 hours, these three teams of speed runners were able to show off the entire Donkey Kong Country trilogy. Highlighting the slight differences in strategy between the three games really brings out the nuance of speed running. It was a great time and a great shot of nostalgia. 1st Place: Team Diddy, 2 hours, 8 minutes, and 21 seconds. 2nd Place: Team Dixie, 2 hours, 9 minutes, 35 seconds. 3rd Place: Team Kiddy, 2 hours, 12 minutes, and 16 seconds.